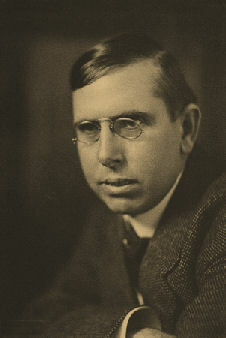 Theodore Dreiser was born on August 27, 1871, from parents Sarah Schanab and Johann Dreiser in Terre Haute, Indiana. He was born the ninth of ten children, and lived a rather harsh childhood with his family. During the first sixteen years of his life he moved around in Indiana, living in five different towns, including a brief stint in Chicago; at times, he only moved with part of his entire family (his mother and two younger siblings, Ed and Claire). As a result the numerous relocations and other family troubles, Dreiser's youth was an emotionally unstable time for him, further worsened by the teachings of his German American catholic school. Dreiser was "forced" to adhere to the very strict teachings of his school, centered on the Roman Catholic religious denomination, which most likely to lead the deep criticisms of the Catholic religion prominent in his later writings. Dreiser was very fond of his mother as he was growing up, while blaming most of his family's problems on his father, Johann. In his autobiography, Dreiser wrote that whenever trouble came his family's way, his father would insist on the ideal that "true happiness was to be found only with God in the afterlife" . His mother, on the other hand, took in boarders, washed clothes for their more well-off neighbors, and was deeply troubled by her own disability to provide her family with a better life. Shortly after turning sixteen, Dreiser moved to Chicago to get away from his family's poor standing in Warsaw, Indiana. He held a few simple, dead-end jobs until a former teacher of his named Mildred Fielding came to him in 1889, and persuaded him, and paid for a year of his tuition, at the University of Bloomington-despite the fact that Dreiser never finished High School, though he was a good student. He attended the university for a year, and then took a job as a reporter. Dreiser continued his education continuously, though, by reading a number of books spanning subjects like science, philosophy, and, of course, fiction novels. In June of 1892, Dreiser, soon to be twenty-one years old) wrote his first news story for the Chicago Globe. He had the dream of having his own by-line, "a column the public would read because his name appeared above it" . He did get a number of quality assignments as a drama critic, feature writer, and an investigative reporter though. Dreiser was known, even then, for his special features, and one editor referred to him as "a writing machine." In 1893, Dreiser was to show a number of schoolteachers from St. Louis around the World Fair as a result of their winning a contest held by the St. Louis Republic. Of the group, Dreiser was particularly interested in one teacher named Sara Osborne White, who was nicknamed "Jug" due to her tendency to wear the color brown. To Dreiser, White "exuded 'an intense something concealed by an air of supreme innocence and maidenly reserve'" . At one point, Dreiser attempted to kiss White, who then told him to not to be "sentimental" . After showing one of his friends, John Maxwell of the St. Louis Glove-Democrat, a picture of her, Maxwell told Dreiser: "If you marry now-and a conventional and narrow woman at that, one older than you, you're gone" . Theodore Dreiser and Sara Osborne White were married in 1898. Dreiser cheated on his wife often. In the year 1900, Dreiser's first book, Sister Carrie, was published by Doubleday; through the publisher did nothing to promote the book. One of Doubleday's editors, however, worked with Dreiser, and eventually published a heavily edited version of the book in Britain, to which it received critical acclaim, and was the gateway to the book's far more popular acceptance in America. Dreiser went on to write more books, such as Jennie Gerhardt, The Financier, The Titan, and many more up to the point of his death on December 28, 1945, shortly before he completed the final chapter of The Stoic. He died from heart failure and was buried in Hollywood's Forest Lawn Cemetery on January 3, 1946. At the encouragement of his wife and another one of his friends, a novelist named Arthur Henry; Dreiser began work on a novel of his own. His primary source for the novel was the story of his sister Emma's affair with a man named L. A. Hopkins, a married man who had eloped with Emma along with funds which he had stolen from his Chicago employer. Dreiser found a publisher, Doubleday, who would put out his work, though ended up refusing to publish the novel in November, 1900. One of Doubleday's editors, Frank Norris, put in a strong recommendation to the publisher's owner after reading the book himself and loving. Doubleday's owner, Frank Doubleday, disagreed with Norris' assessment of the book due to its "immoral" nature in that a "fallen" woman as the main character could succeed under dark circumstances . Dreiser used this story often as his proverbial tale for censorship of the time. Though Dreiser refused to switch publishers for his book, and continually put pressure on Doubleday, whose lawyer insisted that the publishing company put the book out or put to risk Doubleday's good name. Eventually the book was put out, but Doubleday did nothing to promote its sale or even its existence, for that matter. Frank Norris, working with Dreiser behind Doubleday's back, eventually put out an edited and truncated version of the novel in 1901 in Britain; the novel, Sister Carrie, received critical acclaim from English reviewers. Sister Carrie is Dreiser's tale of Carrie Meeber, a normal young girl from Columbia City who is invited to Chicago by her seemingly-estranged sister's family (her, her husband, and their young child). Carrie is of an upper-middle class who desires the luxuries and flashy attraction of the ever-growing city of Chicago in nineteenth century America. Though when things arrive, Carrie finds herself in a bad position as she works a very low-paying job in a sweatshop, has no money, and is not having anywhere near the fun she had imagined having in any of the flashy, attractive locales that the city of Chicago has to offer. Things continue to look bleak until Carrie meets a pair of men who are very interested in helping her (and interested in her, in general). One is Charles Drouet, a charming salesman with a heart for romance, and who never seems to take any romantic relationship seriously. He helps to get Carrie on her feet by supplying her with money, and a place to stay so that she can get away from her sister's dull and troubled life. The other man in Carrie's life is George Hurstwood, a manager of a saloon in Chicago, and is a man of wealth and importance-though also a married man. Hurstwood eventually falls in love with Carrie, and tells he loves her, without mentioning the fact that he is married to her; Hurstwood's wife finds out and files for divorce. He steals ten-thousand dollars from his saloon and flees with Carrie to Montreal and the two are married before his divorce with his wife is complete. Throughout the rest of the book, Hurstwood's mental state is in constant declination, and it is worsened when Carrie leaves him. He eventually becomes a homeless beggar and commits suicide. Carrie eventually becomes a famous actress in New York City, and finally achieves her dream of a flashy and glamorous life. Sister Carrie marks a turn in American literature in that its main character, Carrie, achieves success through necessary, though highly immoral, means; she essentially gets her "start" by sleeping with one upper-middle class man, Drouet, and then gets the "bigger break" she needs by involving herself with the far more rich Hurstwood, and she uses him to achieve her start as an actress, which pays off in the end for her as she becomes rich and famous on her own accord. With Sister Carrie Dreiser mixes his philosophical speculations from his time as a reporter in Chicago with a far more naturalistic approach to the gritty, real-world details of city life in Chicago.